Centex Homes began Stone Creek Ranch as a 440 acre master planned community in South Charlotte in the early 2000′s and in recent years has been joined by new home builder Pulte Homes. In either case the selection of home styles in Stone Creek abound in this large South Charlotte neighborhood starting at $200k and ranging into the $450k range. All spaciously designed and many with gourmet kitchens, lovely stairways, and balconies in addition to many other eye-catching features. Conveniently located in the center of the development is a large Stone Creek Ranch pool and clubhouse along with a play area for the children. Nearby you will find some of Charlotte’s best golfing, in the likes of Piper Glen, Raintree, and Providence Country Club as well as Charlotte Golf Links running along side the subdivision. Be sure to check out the Townhouse properties as well. The neighborhood is assigned to the Charlotte-Mecklenburg School District and includes walking distance Polo Ridge Elementary, J.M. Robinson Middle School, and Ardrey Kell High School. 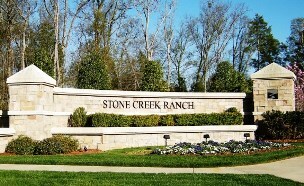 To explore Stone Creek Ranch and other nearby neighborhoods within Charlotte NC visit our Stone Creek Ranch Neighborhood Map and view our Stone Creek Ranch Homes for Sale Map for detailed locations of each current Southwoods listing. From Uptown Charlotte take I-77 S/US-21 S for 6.6 miles, then take exit 1B for I-485 E toward Pineville 1.4 miles, merge onto Interstate 485 Outer 7.5 miles, then take exit 59 for Rea Rd, turn right onto Rea Rd, and then left onto Ballantyne Commons Pkwy you are there. Previous post: Charlotte NC Is Now the TOP BANANA! It’s Not Just About the Bubble Wrap!